Pete & Blair – World Champs again! Home/All News/Pete & Blair – World Champs again! Peter Burling & Blair Tuke have secured their fourth consecutive world 49er Championship! These guys are legends! On behalf of all the members at RAYC – we wish to congratulation Pete and Blair on this awesome achievement. Peter Burling and Blair Tuke have won their fourth consecutive Olympic 49er World Championship after successfully defending their crown in Clearwater, Florida, further extending their unprecedented string of regatta victories to 24 straight wins. Meanwhile Alex Maloney and Molly Meech have finished the 2016 49erFX World Championships in 8thoverall. Peter Burling and Blair Tuke have taken the 2016 49er World Championship in impressive style securing the title defence with two races to spare. Clearwater has thrown high winds and big waves, as well as light air days at the Olympic skiff and multihull fleets contesting their 2016 world championships, yet the phenomenal kiwi 49er pair have come out on top once again. Not even a hand injury, suffered by Tuke early in the event, was enough to derail the pair who taped up and pushed on. Going into today Burling and Tuke were 28 points ahead of the pack and this morning they used the day’s first two gold fleet races to open enough of a points lead to secure the 2016 49er World Championship. A massive 45 point margin was required to get into this uncommon unassailable position before sailing the last 25-boat gold fleet race and the final top ten double points medal race. They went on to place 12thin the final gold fleet race and then 3rd in the medal race and take the title by 41 points. As world sailing has moved towards adding extra weight to the last race of a fleet racing regatta, with the introduction of the medal race, Burling and Tuke defy statistics and deliver the improbable. Four consecutive 49er World Championship titles is something not seen before and the achievement places Peter Burling and Blair Tuke firmly into the record books. They now draw equal to Nathan Outteridge’s accomplishment of four 49er World titles (2008, 2009, 2011 and 2012). 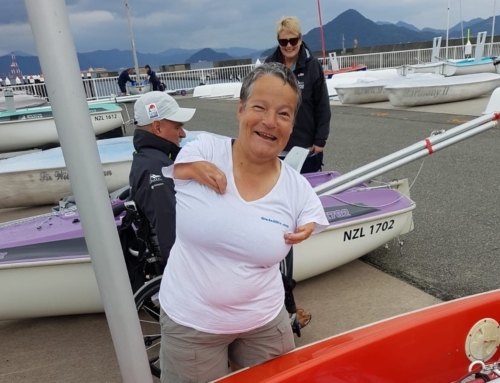 Perhaps even more impressive is their mounting tally of consecutive regatta victories which now reaches 24 straight Olympic 49er class regatta wins including this year’s 2016 New Zealand 49er National Championship and now the 2016 49er World Championship. This sort of accomplishment is particularly impressive in the sport of Olympic sailing where venue, conditions and large fleets make consistency on this level incredibly difficult to achieve. Being able to perform and finish at the front across all conditions, superior boat handling, tactical brilliance and great teamwork are among their campaign assets which set them apart from their rivals. Despite their incredible track record over recent years it seems it has taken a long time for New Zealand sporting fans and mainstream media to recognize quite what these two, who quietly go about their business, are achieving in the Olympic 49er class. While prioritizing their Olympic campaign towards Rio 2016 both Burling and Tuke compete in a combination of sailing disciplines which seems, for them, to be beneficial in cross crediting knowledge and skill. In January 2014 Emirates Team New Zealand announced that they had signed the pair, and a little over a year later their roles with the America’s Cup Challenge stepped up with Burling announced as helmsman for the 2017 campaign. The pair is coached by Hamish Willcox, a three-time World Champion in the Olympic men’s 470 class himself. Burling, now 25 years old, grew up sailing in the Bay of Plenty at the talent breeding Tauranga Yacht & Powerboat Club, while 26 year old Tuke started his sailing career in Northland, New Zealand with the Kerikeri High School sailing academy and he represents the Kerikeri Cruising Club. Burling was just 17 years old when he represented New Zealand, and finished 11th at the 2008 Beijing Olympic Games, sailing in the men’s 470 class with Carl Evans. He became the youngest sailor ever to represent New Zealand at the Olympic Games, and was the youngest member of the 2008 New Zealand Olympic Team. Subsequently joining forces with Blair Tuke to mount an Olympic 49er campaign the kiwis became friends and training partners with the talented Australian pair of Nathan Outteridge and Ian Jensen and rose through the ranks. Leading into London 2012 Outteridge and Jensen were the team to beat, but that proved impossible and the Australian’s claimed the Olympic gold while Burling and Tuke collected the silver, which happened to be New Zealand’s 100th Olympic medal. Since then the kiwis have developed an indomitable determination to go one better and win Olympic gold for New Zealand embarking on an unprecedented run of victories at all the major international 49er regattas they’ve attended. Burling and Tuke are the 2013, 2014, 2015 and now 2016 World Champions in the 49er, they also won the 2013, 2014 and 2015 49er European Championships. 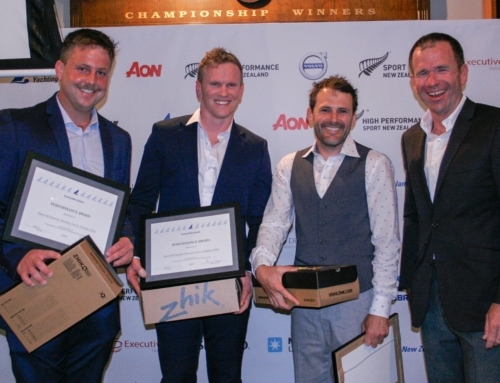 They were awarded the ISAF World Male Sailor of the Year for 2015, and are finalists for New Zealand’s prestigious Halberg Team of the Year to be announced this Thursday in Auckland. Things really heated up in the women’s 49erFX class today with some mixed results from some of the top placed crews and others fighting it out against their national team-mates for Olympic selection. The FX women raced three gold fleet races this morning in which the New Zealand duo of Alex Maloney and Molly Meech placed 11th, 12th and 5th which saw them go into the final medal race lying 7th overall. Decreasing and shifting breeze saw the 49erFX medal race sailed in very funky conditions, the kiwis crossing the line in 9th and closing the regatta in 8th overall. Spain’s Tamara Echegoyen and Berta Betanzos have taken the 2016 49erFX world title ahead of Maiken Foght Schutt and Anne-Julie Schutt of Denmark, with Germany’s Victoria Jurczok and Anika Lorenz claiming the bronze medal. This regatta has demonstrated that the 49erFX class will be exciting to watch when it makes its Olympic debut in Rio this year.